The New Forest woodlands are arguably at their best in autumn, during the annual Pannage Season. Magnificent landscapes of gold and crimson echo to the sound of rutting deer. Fungi of all shapes and sizes appear as if from nowhere, squirrels scurry about the woodland floor, and a bright array of birds gorge on fallen beech mast and acorns. 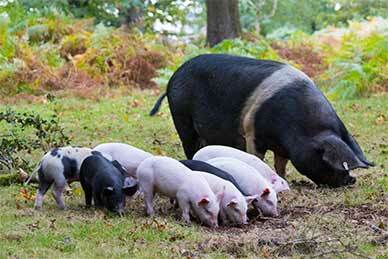 And New Forest pigs and piglets aplenty also feed on beech mast and acorns during the Pannage Season, pigs put out by New Forest commoners exercising the common right known as Common of Mast. As well as getting nicely fat, Common of Mast pigs and piglets provide a valuable service, for acorns are poisonous to ponies, cattle and sheep, but do the pigs no harm. So pigs are used during the Pannage Season as live vacuum cleaners, put out to mop up the potentially deadly harvest. (High numbers of acorn-related deaths amongst the commoners' stock usually occur in years when the acorn crop is particularly heavy. In 2006, for example, forty-seven deaths were recorded, whilst by late November, 2013, another bumper acorn year, forty-seven ponies and sixteen cattle had already died after eating the toxic harvest, and by mid-January 2014, a total of 90 ponies and cattle were known to have died. Annual death rates, however, are more usually from four to six animals). The Pannage Season lasts for a minimum of 60 days. The start date varies, depending on the weather and when the acorns fall, and is agreed between the Forestry Commission and the New Forest Verderers, who can, when the acorn crop is particularly heavy, request an extension to the 60 day period. 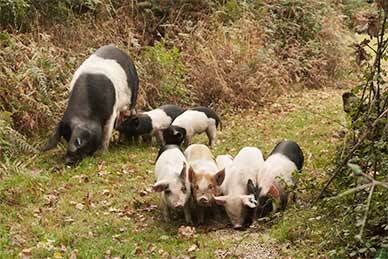 Application can also be made by commoners who enjoy the right to Common of Mast, to leave well-behaved, pregnant sows – known as being ‘in-pig’ – out on the New Forest beyond the end of the Pannage Season. They must, though, be brought back to the homestead each evening, and be removed from the New Forest immediately after giving birth. Tracking down pigs for removal, however, is not always easy, for some will travel many miles in the quest for food or a mate. Then, to bring searches to a successful conclusion, commoners depend on an intimate knowledge of both the area and the pigs, and information supplied by helpful neighbours and agisters. Numbers of pigs put out each year during the Pannage Season often fluctuate in step with the scale of the acorn crop - in recent years, between 50 to 600 have been put out, although in the 19th century, when home-grown bacon was perhaps more highly valued, 5,000 - 6,000 were often put out annually. Intelligent, inquisitive creatures, pigs can cause a degree of consternation and even fear around the camp sites, although almost all are placid creatures that do no more than search for food. Indeed, one of the New Forest’s most amusing sights is regularly provided by groups of piglets lying in the sun, often one on top of the other, huddled together for comfort and warmth. Passers by, though, should beware, for pigs can be unpredictable animals. In one recent autumn, a horse threw its rider when startled by a large sow that then attempted to bite the fallen horsewoman’s legs. In a separate incident, a policeman with his dog was chased by a group of a dozen pigs – the policeman said ‘they just rounded on me’! And in early October, 2017, a walker was bitten by one of a group of four pigs that charged at him as he strolled across Mill Lawn, Burley - the animals were then seen to chase two young women across a nearby stream. By far the best advice, then, is to steer well clear of pigs, and keep dogs away as well.